Sound and light synchronized with rhythmic dancing of these fountains is truly a visual delight. This fountain creates a fascinating show with water jets in variable patterns that swing to the rhythm of the music. Our Musical Fountains can be easily programmed to any type of music. The mix and match functions can be controlled by digital fountain controller (sequencer). We offer unparalleled quality of Musical Water Fountains to our clients, which are crafted using latest technology. These fountains enhance the beauty of any interior space and homes. We offer our range is different sizes and specifications, which can be customized as per the requirement of clients. Moreover, with the help of our team members, we are capable of meeting the bulk demand of clients within a committed time frame. Our company holds expertise in offering a superior range of Musical Fountain to our esteemed clients at competitive prices. These are particularly designed by our experienced designers and are well known for their light and sound synchronization, which looks like colorful water dance. Furthermore, our range is ideal for any type of music and helps the creation of a fabulous program. We offer our range at industry leading prices. Musical Fountains are programmed to have required outlook. These flows as per the pitch & frequency of music. Every single jet or group of jets is connected to PLC. These fountains are enjoyed by all age groups and are the center of attraction at children parks, amusement center, lawns, hotels etc. 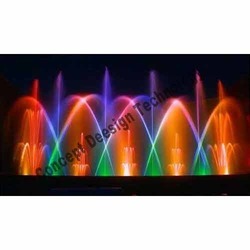 Concept Design are the bulk suppliers of variety of musical fountain, water fountain, musical water fountain, large musical fountain, grand musical fountain etc. A Musical Fountain is something like or a type of animated fountain. It creates aesthetic design for entertainment purposes. It produced three-dimensional effects. This three-dimensional effect is achieved by employing the effects of timed sound waves and timed light including laser against water particles. The water refracts and reflects the light and in doing so, three-dimensional images can be produced. Musical features tend to be complex because it requires a degree of mechanical, hydraulic, electrical and electronic components out of view that might be as impressive to its audience as the show itself. We design various ranges of Music Fountains according to our clients need. We design Musical Water Fountains with three water features, five water features, seven water features etc. It is easy to install with its beautiful look & charming music. These fountains are enjoyed by all age groups and are the centre of attraction at children parks, amusement centre, lawns, hotels etc. Our Musical Fountain range weaves magic out of water, light and music. Audiences of up to thousands are entralled by the spectacular show of colours and ever moving water effects synchronised to almost any music. Unlike the traditional style with a limited range of repetitive patterns Premier Musical Fountains have a tremendous variety of effects and can play beautifully with almost any type and style of music from any culture. Looking for Musical Fountain ?